You can share your sessions with your colleagues so that everyone working on the comparison project has the same options. You can save comparisons for later viewing. If you have many sessions but do not need to use all of them at the same time, you can save them to session files to organize them. As you can see in the screenshot above, you can load and save session files from the Compare dialog, as explained here. In addition, you can load and save session files from the Files or Directories menu, as shown below. As you can see, ExamDiff Pro also stores recent session files and auto sessions (sessions within ExamDiff Pro) for quick re-use. 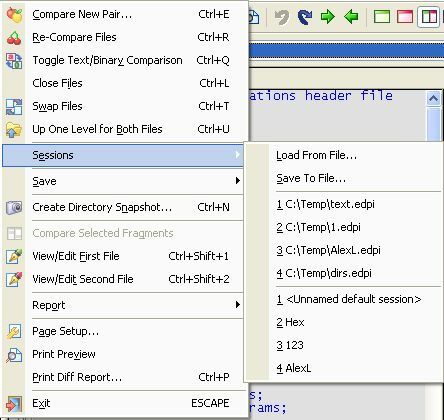 The screenshot below shows what ExamDiff Pro session files look like in Windows Explorer. When you open a session file by double-clicking on it, ExamDiff Pro automatically starts the comparison that was stored in the file, importing the session file's options into a new auto session.